Making Italian Pizza like a Pro: Over the weekend we were invited to a pizza gathering that my friend Mike Vaccaro hosted. He has been focusing his time and energy on learning how to create an authentic Italian Pizza! 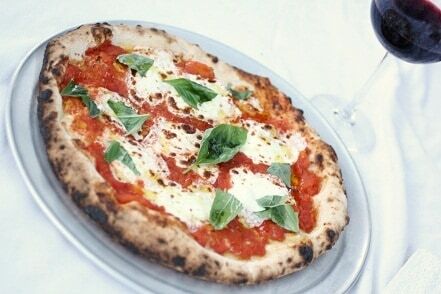 I am also a bit of a pizza fanatic and I am always looking for ideas and techniques for crafting a true Italian style pizza. Mike built an outdoor pizza oven that really gives his pizza that edge. Since I don’t have a pizza oven yet I am working on a dough recipe along with techniques to use with my indoor oven. I am determined! 1. Make your dough 4 days before you need it. The dough needs to be refrigerated for about 3 to 4 days before you start to work with it. It has a better flavor when it sets for awhile. 2. Use a good Italian Flour: Farina Tipo 00. This part will require more research since I will need to test the lower protein flour verses the higher protein options of Farina Tipo 00. 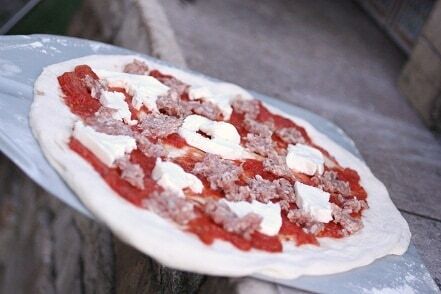 NOTE: If you have an outdoor pizza oven then the higher protein Farina Tipo 00 will work best. I think for my indoor oven I will need to go lower on the protein but I am going to test it out. 3. Light hands. No rough housing with this type of dough. Finesse and technique with handling is super important. 4. Good cheese is key. When using Mozzarella di Bufala make sure to pat it down to get a bit of the moisture out so it bakes better and doesn’t become runny and too milky. 5. Tomatoes are just as important as the cheese. Use good San Marzano tomatoes which is a must with anything you do Italian! – Add the yeast into a small bowl and sprinkle in the sugar, add 1/2 cup of lukewarm water and stir to dissolve the yeast and the sugar. Cover with a kitchen towel and let it sit in a warm spot for 30 min. – Sift the flour into a large bowl, then make a well in the center. Pour the yeast mixture, salt and olive oil and about 5 to 7 tablespoons of lukewarm water. – Knead everything into a smooth silky dough that you shape into a ball. Dust the ball with a little flour, cover and set aside in a warm place to rise for an hour or until it double in size. – When it rises dust with a little flour again and roll into a ball and let it rise again for about 30 minutes or until is doubles again. After it rises the second time roll into a ball again and store it in a container in the fridge for up to 4 days. Here are some scenes from our Sunday Pizza Adventure! We had so much fun making different varieties of pizza. I can’t wait to share what I figure out in my own kitchen! Coming Soon! Will definitely try it… Thanks a lot! Question about the ingredients. The recipe says salt and then sea salt with no mention of the amount of olive oil. In the ingredients, it says to add the olive oil following the salt. To me, 3+ tablespoons of salt seems to be a lot. Is this supposed to be 3 TBs of olive oil? yes, thanks for brining that to my attention! Corrected. Hi Carrie what temperature do you bake the pizza on?